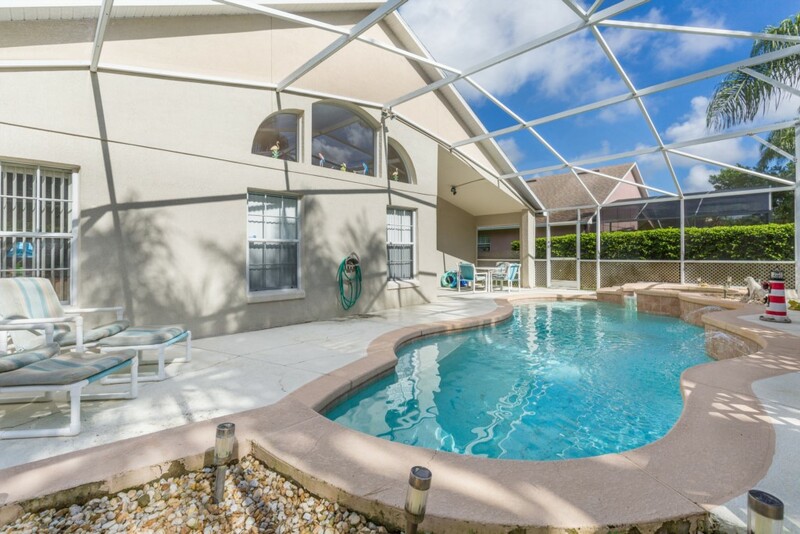 Welcome to Oak Island Retreat, your private and luxurious 3 Bedroom 2 Bathroom Pool Home just 3 miles from Disney World. One has a king bed, the other a queen bed. The third bedroom has a twin set of bed. 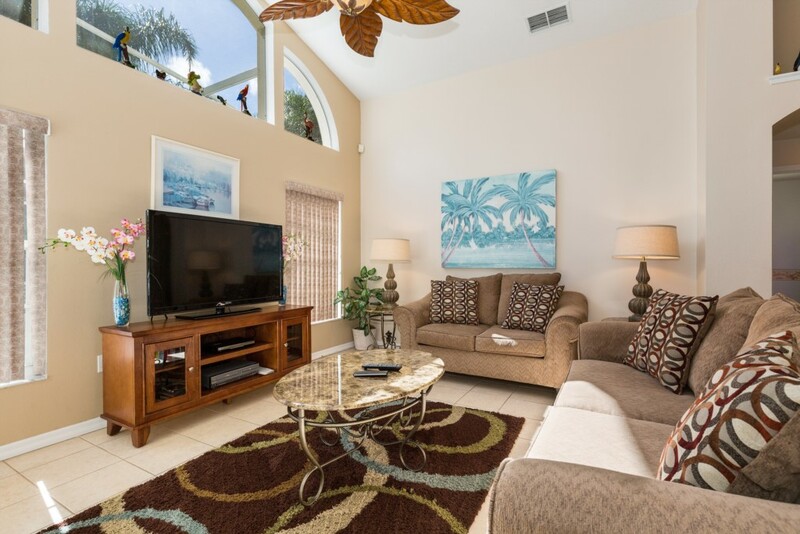 The living room includes a 36” flat screen television. Walk out the sliding doors to a large furnished deck to enjoy the built in swimming pool with spa or simply to enjoy the outdoors. The entire deck is screen enclosed. Extremely close to Walt Disney World! 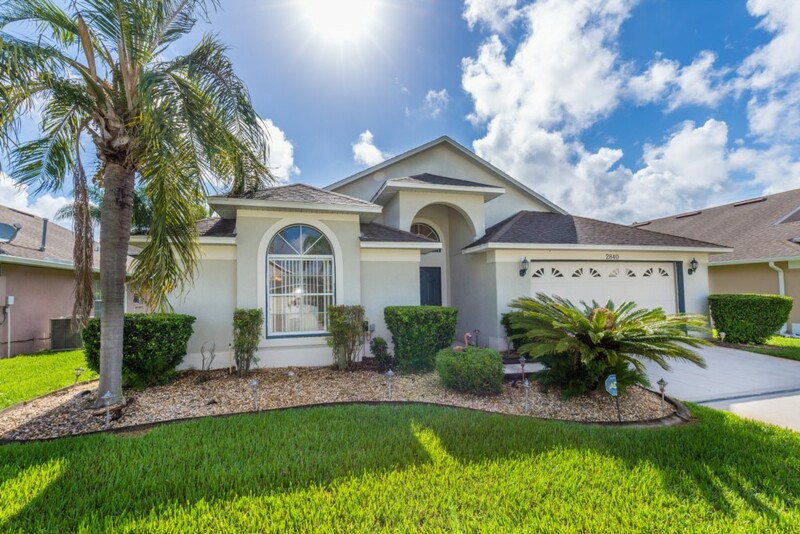 This beautiful home is located in Oak Island Harbor in the Formosa Gardens Area. 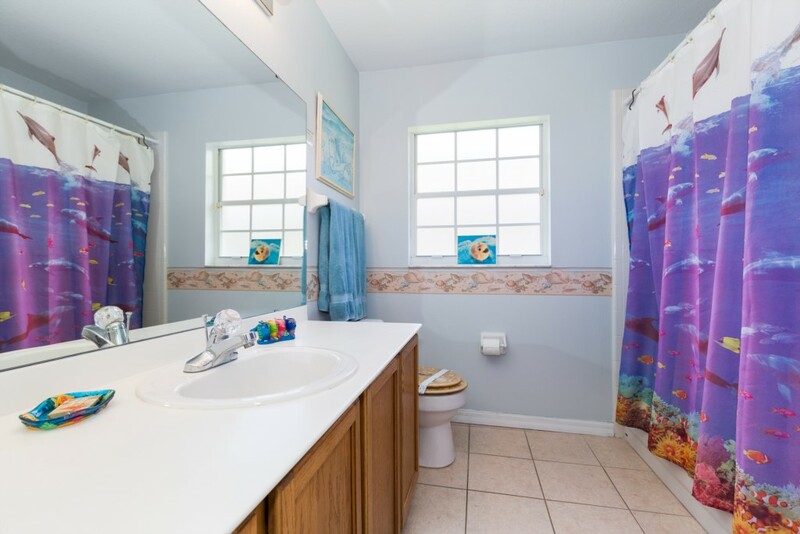 This single story home is situated on a quiet, tree lined street less than 1/2 mile to Highway 192 with an abundance of shopping, attractions, supermarkets and restaurants. 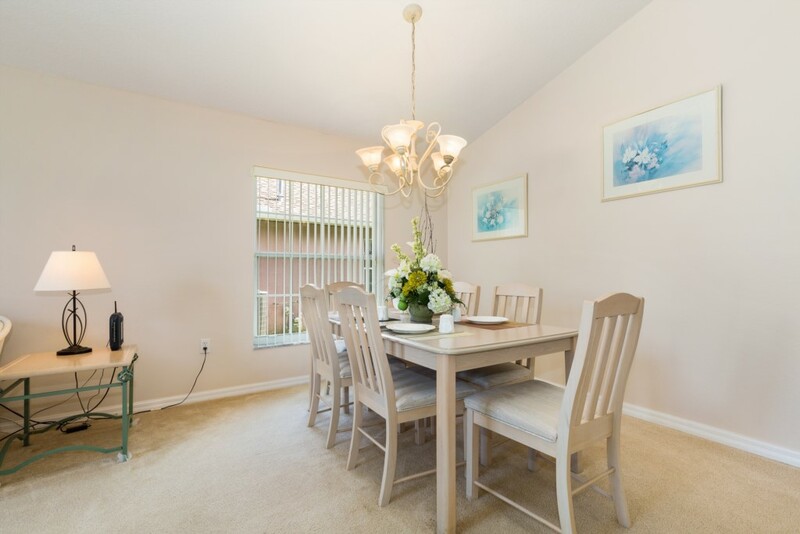 In addition to the close proximity to Disney; this property is only minutes to Universal and SeaWorld Orlando. 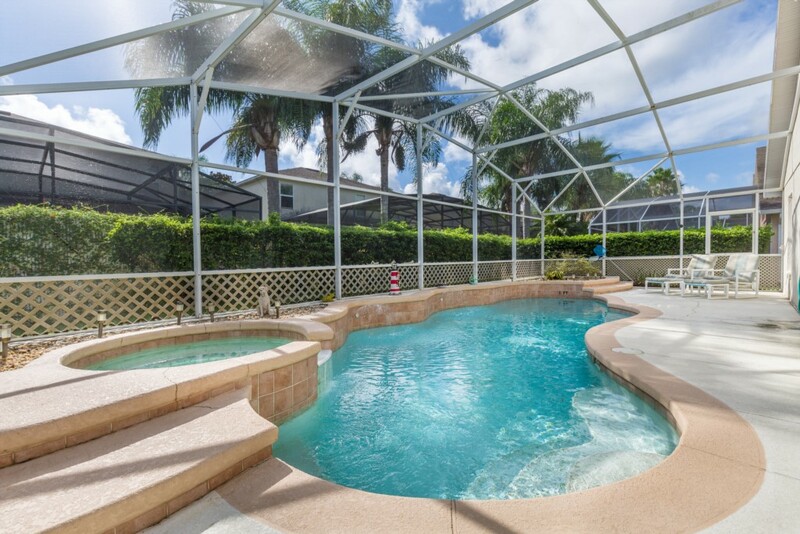 Our gas heated, fully screened pool/spa and deck area is secluded and private. 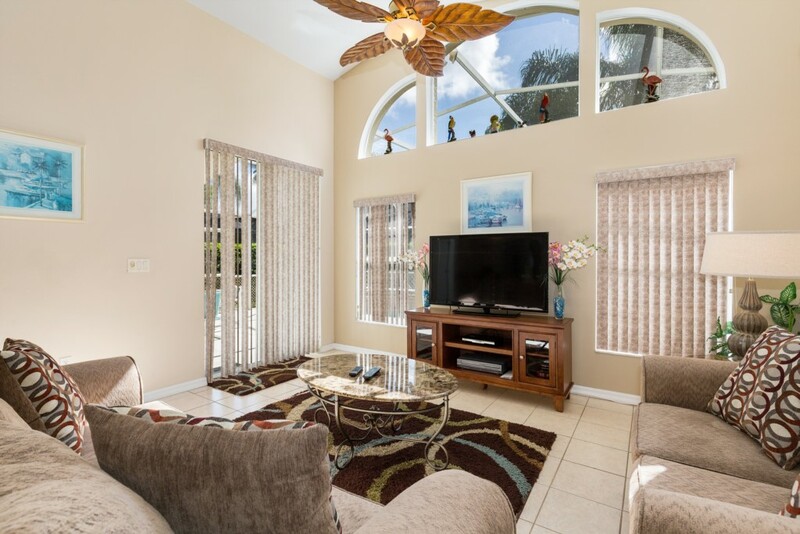 The partially shaded lanai has a ceiling fan above a table and four padded chairs for comfortable outdoor dining. Additionally there are three chaise loungers two of which are padded. Pool towels are provided. All pool doors have child safety alarms. The first floor master suite includes a King-size bed, sliding doors to the pool, flat screen TV and a large walk-in closet. This bedroom also contains a chest of drawers with mirror, two night stands with lamps, ceiling fan and a wicker rocking chair. 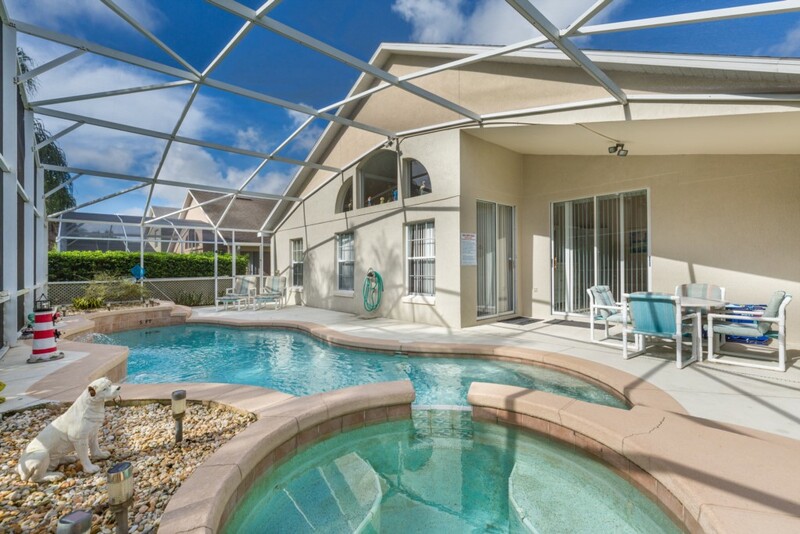 Sliding doors provide direct access to the pool area. 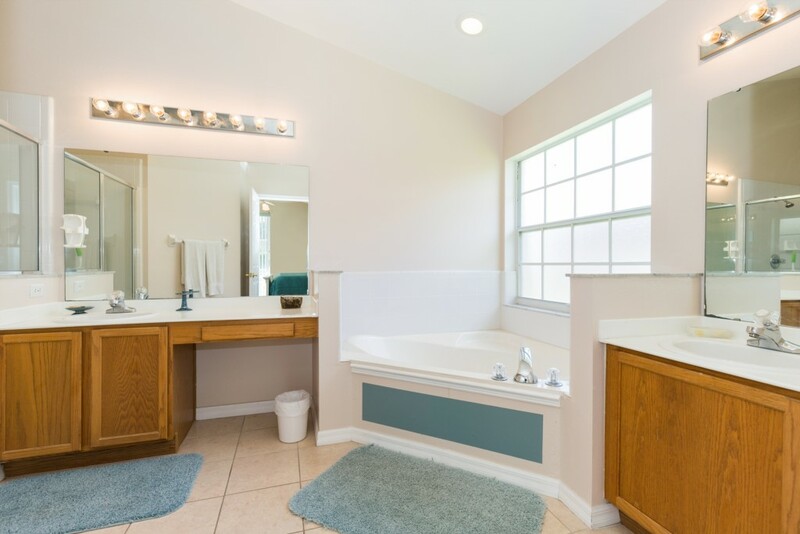 The spacious en-suite master bath has a large Roman tub with a separate shower and a double sink vanity. 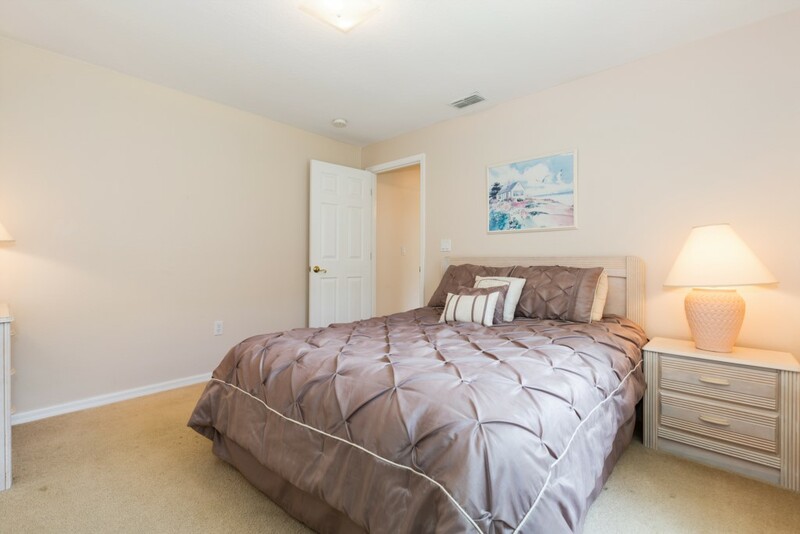 The second bedroom and third bedroom are on the opposite side of the home. The second bedroom has a queen-sized bed, chest of drawers with mirror, bedside tables and lamps, and spacious closet. The third includes two twin beds, chest of drawers, bedside table and lamp, and spacious closets. 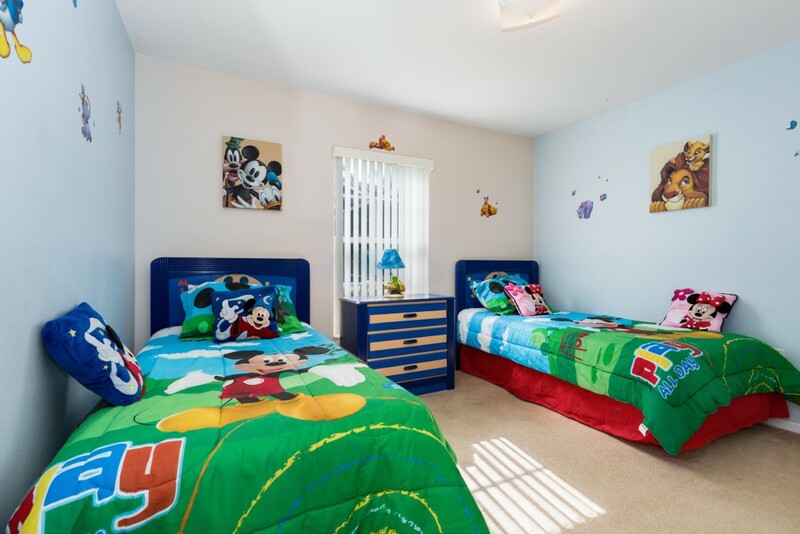 The room is Disney Themed featuring Mickey Mouse Comforters and framed wall photos. All the bedrooms have plenty of storage. Quality towels are provided in both the bathrooms. The fully equipped kitchen contains everything you need to prepare and serve your meals at home. 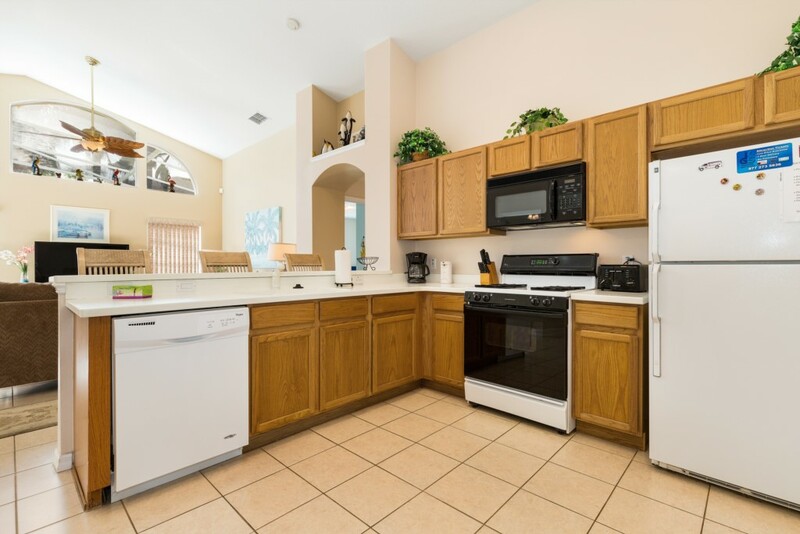 The kitchen has a refrigerator, microwave oven, stove, dishwasher, and small appliances including coffee maker, toaster, and blender. Pots, pans, skillets and all cooking utensils provided with the home make preparing your morning breakfast or evening supper a breeze. The formal dining room seats 6 and the kitchen seats 4 plus 3 additional bar stools at the kitchen bar. 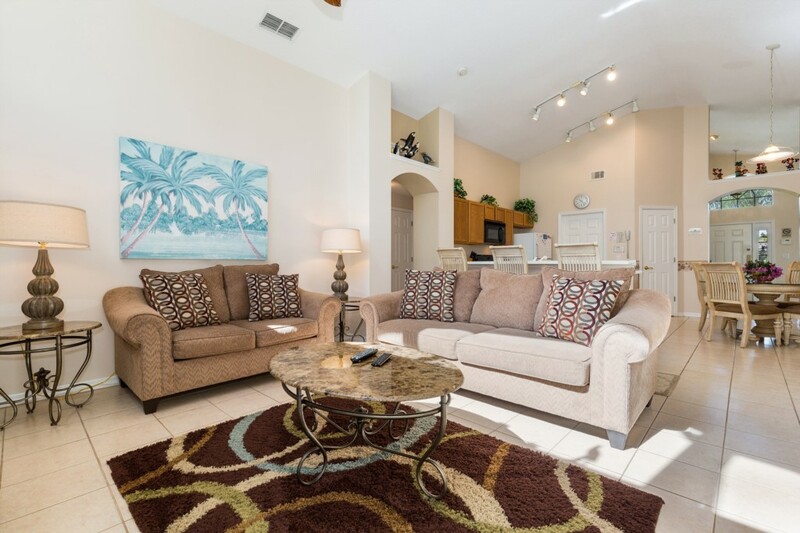 The spacious living room features two full size sofas, large coffee table and 2 end tables with lamps. Also a 36” flat screen TV with cable and a DVD player. 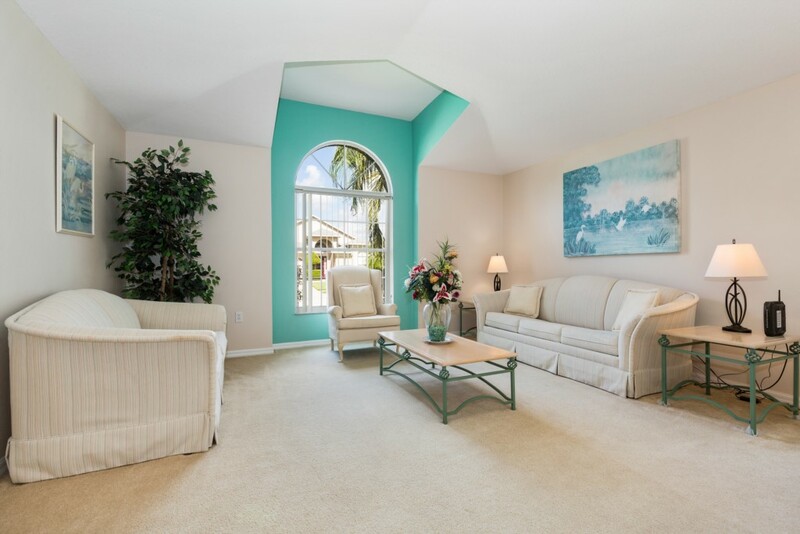 Vaulted ceiling with fan provides a great sense of openness. Sliding doors provide access to the pool. 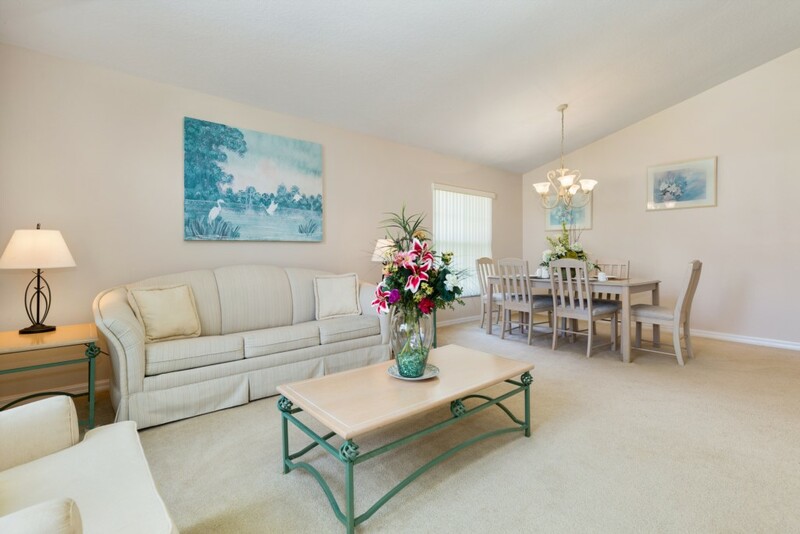 Other amenities include cable TV, Internet access, WiFi, free local phone calls, optional pool heating, a washer and dryer, ironing board and iron, vacuum cleaner, and a professional management company to provide 24 hour assistance assuring your stay is worry free. Sorry but Pets and Smoking are NOT allowed. Note: additional charge applies for pool heat. See Rate Section. Cleaning fee applies for stays of less than 7 nights. Mid-stay cleaning services are available at an extra charge. Pool heating is available for an extra charge**. **Pool heaters have electrical/mechanical components. These components can sometimes malfunction. Mid-Florida Home Management, its Vendors, and the Homeowner cannot be held responsible for any malfunctioning heater or failure of a heater to maintain set temperature during periods of inclement weather. Please inform us as soon as possible if your pool/spa appears to be not working properly. No compensation will be given for a malfunctioning heater. Mid-Florida Home Management will do everything in it power to rectify any problems with malfunctioning equipment as quickly as possible. If a particular aspect of your vacation home is important to your stay, please check with us as we want you to be 100% delighted with your choice of vacation home. We want to make your stay in our home a memorable experience. Please note: the parking of RV's is prohibited in the community. My family of 3 stayed here for 12 days in March 2019. The home is very large for a 3 bedroom, it has both a TV room and a formal living room with a dining room attached. 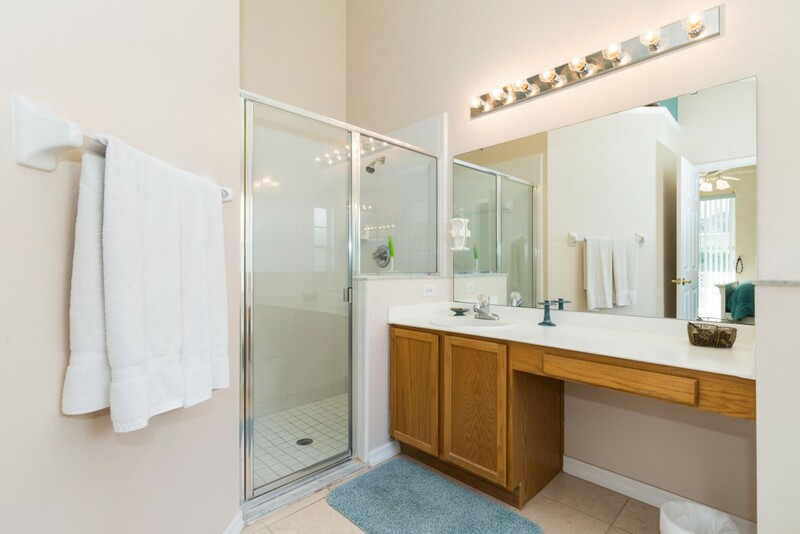 The master bedroom suite was very spacious with a walking in closet and attached huge bath room with a walk in shower and large soaking tub. 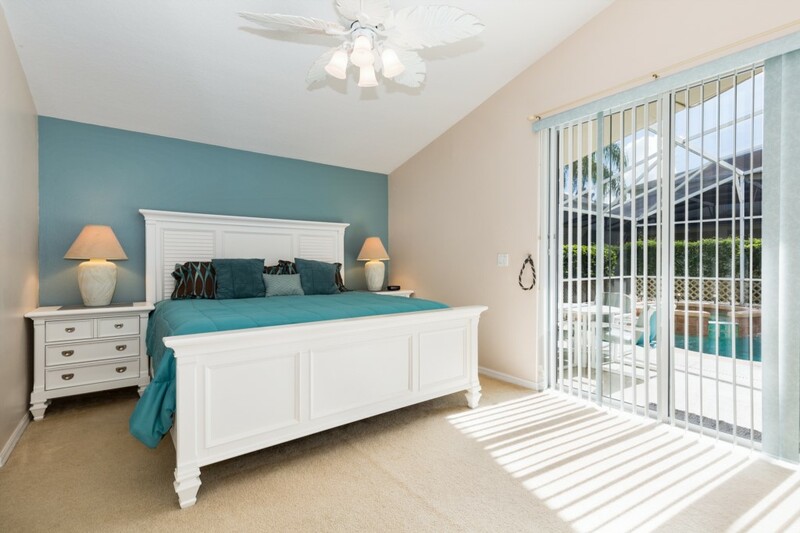 The bed was very comfortable, and we enjoyed the sliding door to the pool area attached to this bedroom. Our son slept in the queen bedroom and said it was comfortable, no issues at all. We did not use the twin bedroom. We only had one small issue, the hair dryer did not work and there was some cookware that the Teflon was pealing off. I emailed then on a Sunday morning thinking it would be addressed on Monday sometime, but a few hours later a lovely lady from the management company came to the house picked up the broken appliances and returned about an hour later with all new. I have extremely happy with the service, she was friendly, kind and helpful. I would definitely book this home again and again. Lots of room, pool are is fabulous with sun until at least 4 in the afternoon, the hot tub was great. Everything was wonderful. Thank you again for a super vacation! Excelente propiedad, muy bien ubicada para ir a los parques de Disney. Walmart está muy cerca como así también lugares para salir a comer. La casa está en muy buen estado de mantenimiento y limpieza, muy bien equipada para cocinar, lavar ropa, mirar TV. Espaciosa, moderna... nos encantó! Ciertamente volveríamos!! 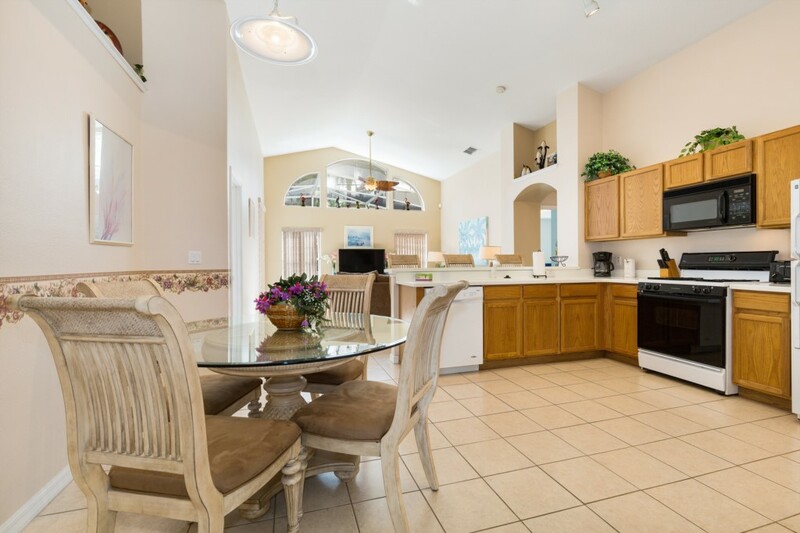 A spacious and well furnished villa. Centrally located in a quiet area. Would definitely stay here again. Great house and excellent location. The house is very roomy and spacious for the entire family. The pool was a fantastic way to cool off in the late evenings. Great house and location!! 15 mins to ESPN Sports Center!! Clean! Roomy and good fun... Outside pool are is perfect. 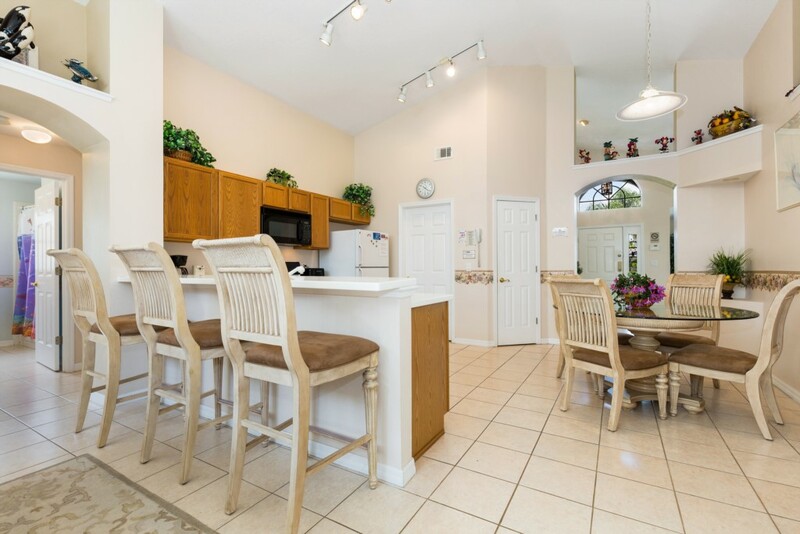 This house was great and we enjoyed our stay March 2018, The house itself is in good shape with all appliances working, has plenty of room and space for a great family stay, our grandchildren loved the pool. We found it easy to travel to and from the parks from this location, most of our time was spent at Universal and even in early morning traffic it only took us about 25 minutes to get to Universal from this location. Todd our contact at Mid Florida Homes was always available and responded very quickly to any questions or inquiries we made. The only improvements that could have enhanced our stay would be the addition of a working security system and a Safe that could be used to store our travel documents. Overall this is a very nice property and I would stay again. 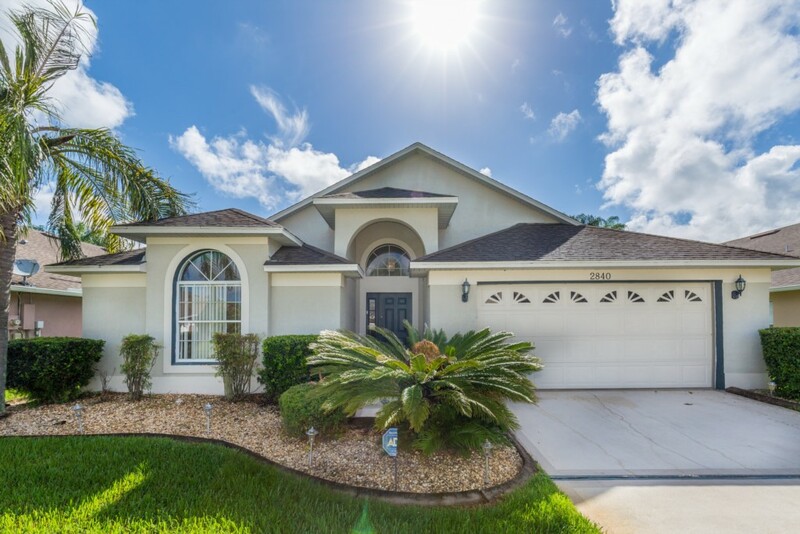 Great location to stay for Disney trip, very nice house. Only problem we had was the heated pool. Only worked 2 of the 5 days we were there. But it was unusually cold and I believe everyone was having problems with the pools/heat.